In moving my happiness lists to Wednesday–something sweet to get through the week–to honor more solemnly each Friday as a “little Good Friday,” I was given the idea by a reader to share a piece of devotional-ish art each Friday. So here’s the first, an off-beat interpretation of Jesus. Providentially, it highlights a theme of my sermon from last Sunday afternoon, Jesus’ beaten body–not only pierced by nails and gashed by thorns, but beaten and abused by his fellows. This little Good Friday practice also reminds and comforts me that even in Eastertide–a season of great joy and triumph–we still face suffering, trials, disappointment, temptation (as my friend, the Rev. Dr. Ephraim Radner, argues in this recent post). 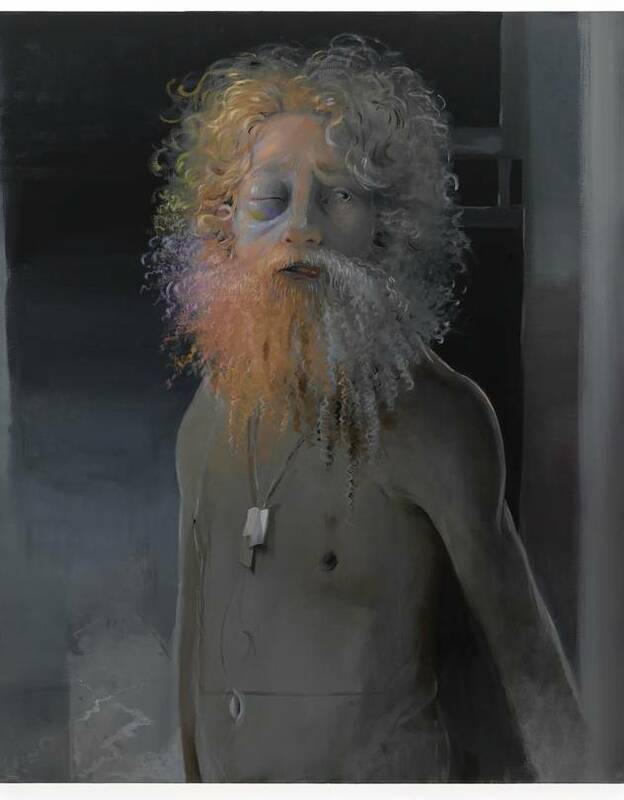 Life is a lot more mixed-up with both joy and sorrow (like the rainbow of the subject’s beard, along with the yellowed bruising on his face) than we’d sometimes like to admit. This entry was posted in art, Good Friday, Jesus and tagged art, brokenness, Jesus Christ by Emily. Bookmark the permalink. Thank you for offering this intriguing piece of art and the penetrating meditation of Father Radner. The suppositions of Saint Francis and his revelation as to what constitutes the “laetitia perfecta” particular force today. I see redemption in this piece as this day has been particularly permeated with sorrow and pain. The agonies of the cross exert themselves in my consciousness with great brutality and it has only been through the recollection of the fellowship and love of my fellow believers and companions in prayer that I am prevented from the deepest despair. I also see in this piece a person who stood across from me at evening prayer last week. Despite our vast difference in background and education we were able to re-affirm our love for Christ and for one another as we said the prayers together. He stood there as a man who had been thoroughly ground down by the world and yet was still able to show forth his love for a fellow believer, who deserved it not, all the while clinging tenaciously to his bible. And finally, I see here a picture of the perplexity of growing old. As we age our hair begins to change from vibrant colour to gray, our bodies begin to change from being robust to weak, and our minds start to change from precise thinking machines into something resembling a modern computer infected with a virus. That sort of change portends toward great confusion and deep despair. We realize that we are now being governed in our daily life and work by something we cannot control (which of course was always the case, we just didn’t realize it) and that soon our faith will be severely tested. It is my conclusion that, like the victims of ergotism in the monastery hospital in Issenheim, it is through identification with Christ’s sufferings on the cross and the unconditional love of our fellows in prayer that we find comfort and peace and the means to reconcile ourselves to God’s will.